Feature of P5 Transparent Led Curtain Screen: 1. High transparency rate: 80% transparency rate without affecting day-lighting. don't need other heat dissipation system. Fostered with a team of dexterous professionals, we have been able to offer P5 Transparent Led Curtain Screen for our valuable clients. We are committed to your 100% satisfaction. If for any reason you feel otherwise with your purchase, contact us and we will be there for you. It featurs high transparency rate, fast lock systems ensure fast installation and low power consumption. 80% transparency rate without affecting day-lighting. don't need other heat dissipation system. Indoor installation, convenient maintenance. 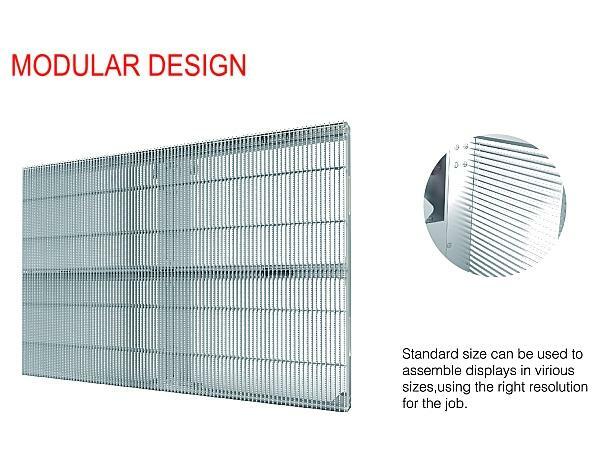 14kg/㎡, and does not occupy space, without changing the appearance and structure of the building. Take 100㎡ as a example, installation period is about 3 to 4 days. and installation cost is less than $46/㎡. Any building with glass wall, bank, shopping mall, chain stores, car showroom and etc.